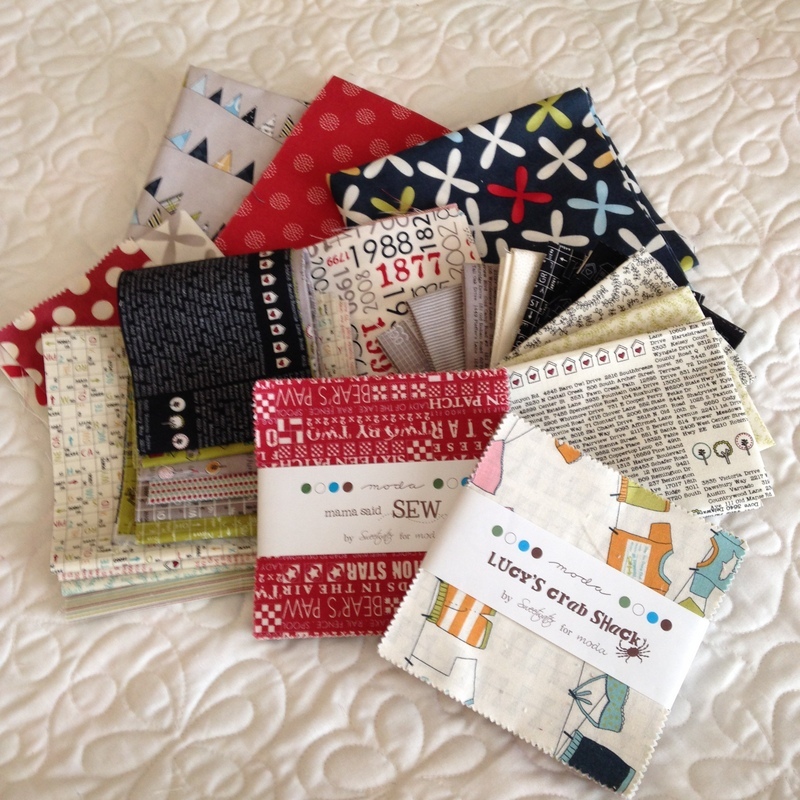 What’s a quilter to do with the scraps that accumulate after Fat Quarter Bundle, Fat Eighth Bundle, Jelly Roll, Layer Cake, and Charm Pack projects? 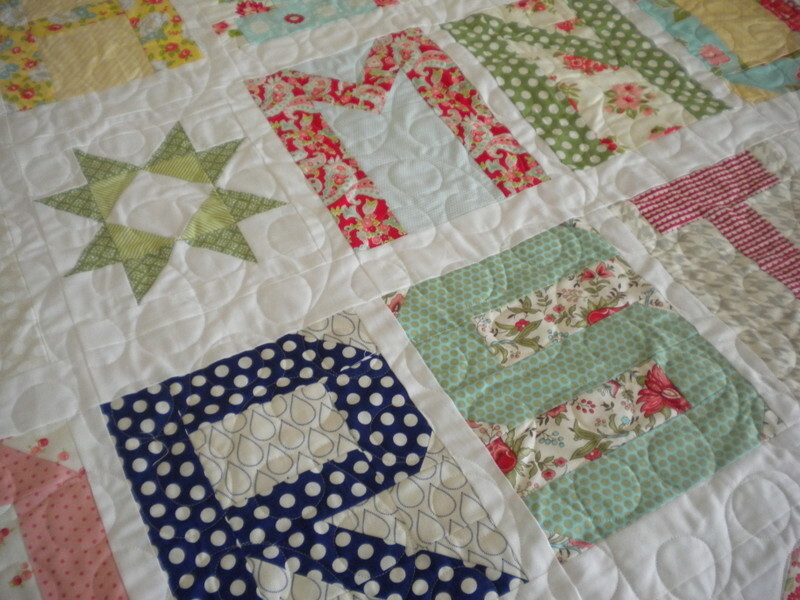 Make scrap quilts of course! 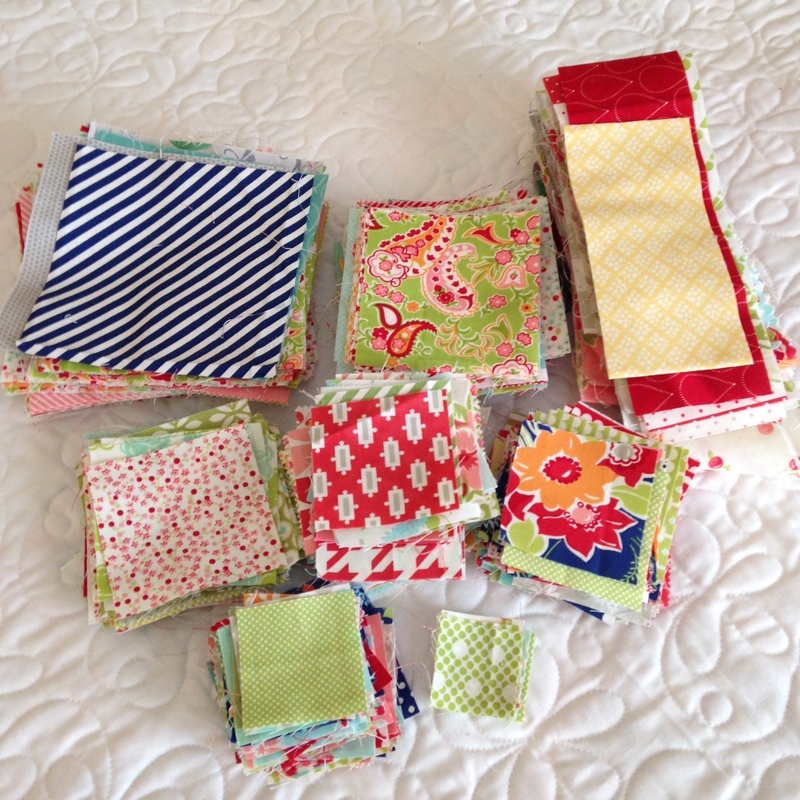 There are many fun possibilities for quilts with your scraps. Or, if you can’t wait for scraps…feel free to break up those bundles and pre-cuts now, mix with other collections, and join in the scrappy fun! 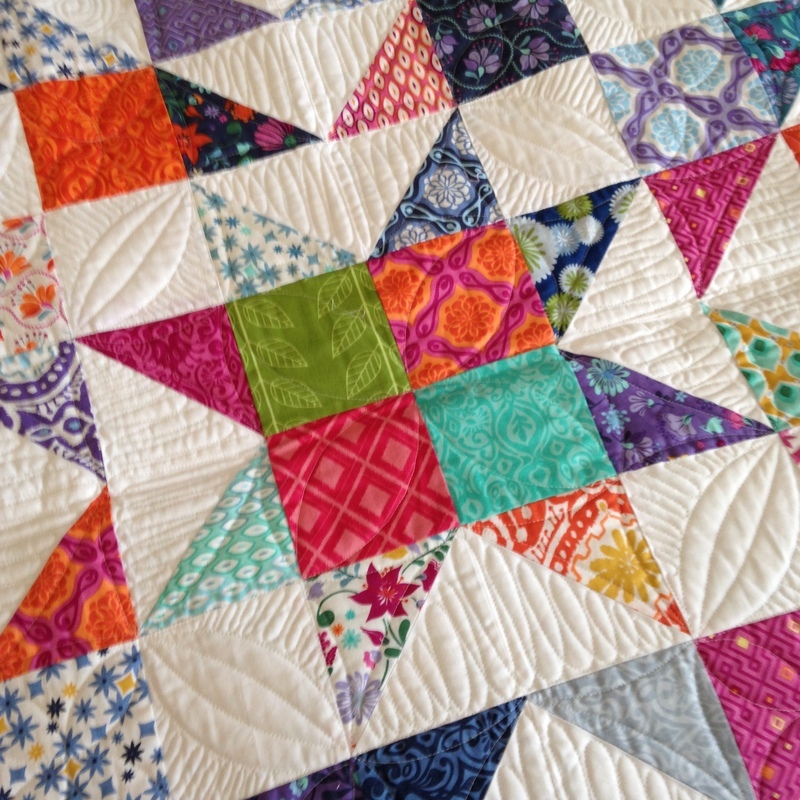 The delightful scrappy tumbler quilt (above) by Carrie Nelson of Miss Rosie’s Quilt Company was pieced with a variety of “lights” from several Fig Tree collections. Carrie mentioned that the Figgy prints are from at least ten different Fig Tree and Company groups; she had yardage of some of the prints and just a fat quarter of others. 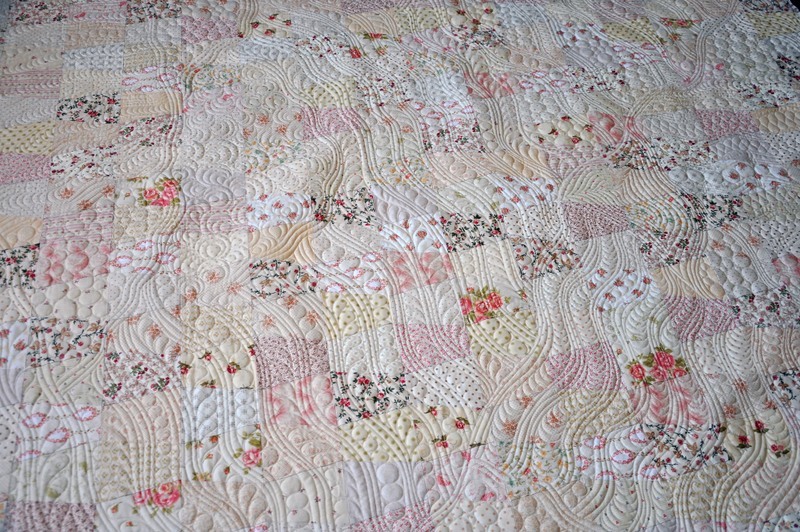 What a beautiful combination that says “low volume” and serenity all in one gorgeous quilt. Of course it is much easier to use your scraps if you cut them into useable pieces after finishing a project. Above are some of the Minick & Simpson left-overs from the scrappy Nested Churn Dash quilt. Charm squares, 2 1/2″ strips, 1 1/2″ strips, and 2 1/2″ x 2 1/2″ squares are good sizes to save; they are perfect for many small projects. After cutting up left-overs, store by designer if you plan to make a scrappy quilt with fabrics from a variety of that designer’s fabrics. Otherwise, it’s best to store scraps by size: use a separate bin or container for each size of scrap stored. The “Spell it with Moda” quilt above features prints from every Bonnie & Camille collection released before “Miss Kate.” By saving scraps from a variety of fabric groups one can piece scrap quilts with bits and pieces of memories from previous projects. 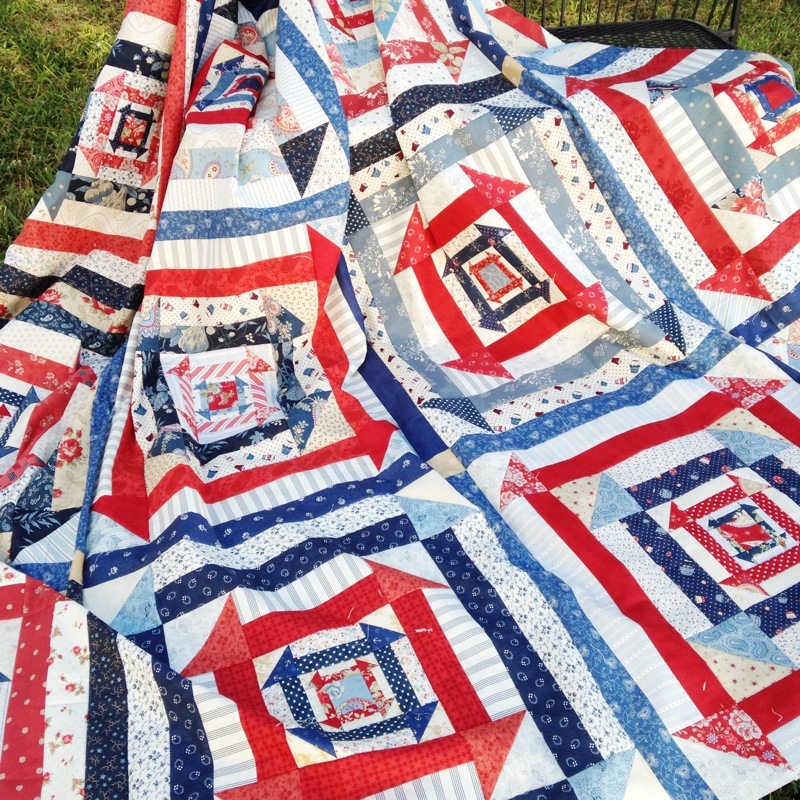 Although the “Spell it with Moda” quilt pattern was designed for Jelly Roll strips and fat eighths, left-overs of all sizes were used to make this version of the quilt. Happy Bonnie & Camille scraps in a variety of sizes. Also, feel free to save scraps in sizes in addition to the ones listed above. How about saving 3 1/2″ x 3 1/2″ squares, 2″ x 2″ squares, and 1 1/2″ x 1 1/2″ squares as well? The possibilities are really so much fun. Collections from Sweetwater are fun to mix and match. Scrappy Moda mix and match isn’t just for a variety of collections by one designer, either. Why not mix fabrics from a variety of designers and see what you can come up with? “Summer Star” from “Fresh Family Traditions” by Sherri McConnell pieced with fabrics by Kate Spain and V and Co. Above is a quilt that does just that–fabrics from Kate Spain and Vanessa Christenson combine beautifully to create a planned scrappy effect in this wall hanging. Pick one designer, two designers, or even several, and start combining scraps from their collections to piece your next project. What are your favorite Moda collections to mix and match? Most recently, I’ve used scraps from Me and My Sister’s Simplicity and Seaside Rose collections! Yep, these are o-o-o-old lines, but I had no time and no plan at the time of finishing the original 2 quilts with these fabrics, so I’ve hung onto them for years. Now I have a beautiful low-volume quilt to sell in our guild show’s boutique (fundraising) and several small make-up bags made using “Strippy Charm Pouch” and “Quilted Patchwork Pouch” patterns, both from Moda Bakeshop! 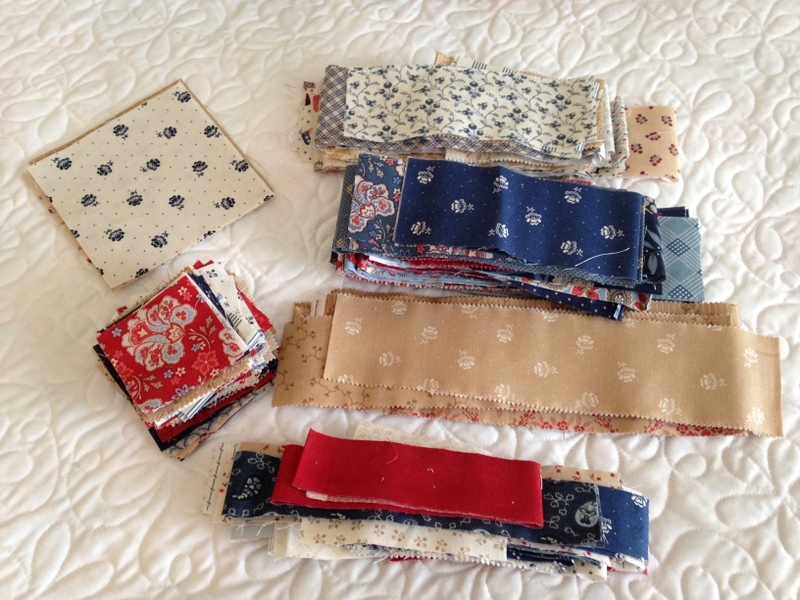 I am accumulating mini charms packs to do a big scrap quilt. I love mixing all kinds of fabrics to get a scrappy feel.